The maths curriculum for Years 1,2,3,4,5 and 6 is based on objectives from the New Curriculum introduced to schools the previous academic year. 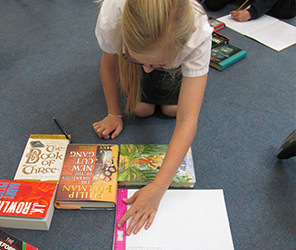 The curriculum taught at Baydon St Nicholas encourages a clear focus on problem solving and the skills of using and applying mathematical understanding. Class Teachers use objectives to plan tailored units of work which incorporate practical “hands on” experiences, games, ICT opportunities, group tasks, investigations and a range of real life contexts which develop both mathematical understanding and problem solving skills. Children are taught maths in their class group with careful differentiation catering for the needs of all abilities and ages. Teachers will work with a combination of individuals, small groups or the whole class depending on the focus. Which calculation methods will my child be taught? Below you will find our calculation policy. The policy lays out the progression of calculation methods for pupils as they progress through school.